ST. CLAIR SHORES, Mich.- Why is our FREE Brake Inspection priceless? Knowing your brakes are working properly gives you peace of mind and can also help you save money by avoiding more costly repairs down the road. Therefore, it is important to stay up to date on routine maintenance and brake inspections. Roy O'Brien Ford's factory-trained technicians will inspect your brakes and measure your pad thickness to determine if your brakes are safe. Recommended when rotors are uneven or damaged. The brake rotor is resurfaced using a brake lathe, creating a smooth surface of uniform thickness. A flat rotor surface helps ensure smooth braking and the even wear of your brake pads over time. 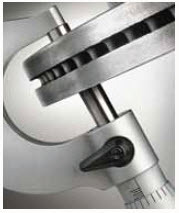 Required when a rotor is below a minimum thickness and cannot be resurfaced. 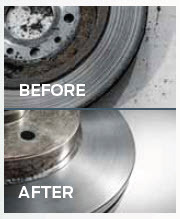 Helps restore your brakes like new. When it comes to your safety, we don’t cut corners. That’s why we use Motorcraft® brakes, engineered and tested to meet Federal Motor Vehicle Safety Standards. Do competitive brake pads meet these rigorous tests? Motorcraft brakes are engineered and tested to meet Federal Motor Vehicle Safety Standards – a rigorous series of tests that measure stopping distance over repeated application so your brakes will stop on a dime. While all brakes wear over time, Motorcraft brake pads and rotors are designed and tested for durability, thus helping reduce the frequency of brake repairs – your wallet appreciates this! Braking should be effortless, just like when you bought your vehicle. When you apply pressure to the brake pedal, you expect the vehicle to stop. Brake noise can be an annoyance. Motorcraft brakes are designed with noise dampeners to help ensure quiet braking. Silence is golden! Schedule your appointment for a Free Brake Inspection and be sure to print out our latest service coupons to help save even more. Stop by our Brake Shop today to see why our Free Brake Inspection is Priceless! Family owned and operated since 1946, Roy O'Brien Ford is located at 22201 E. 9 Mile Rd. St. Clair Shores, MI 48080 for all your Metro Detroit Ford Vehicle needs. Stay on the right track to Nine Mile and Mack!